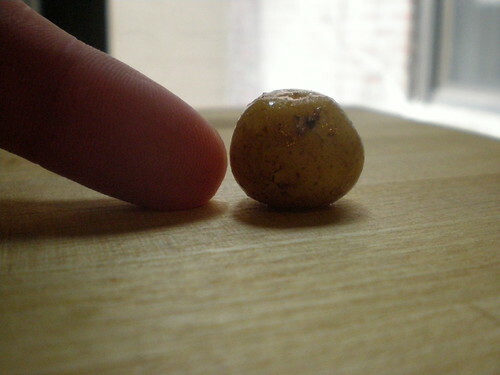 I picked up a box of new potatoes at the Farmer’s Market last weekend, and rolling around the bottom of the container was this tiny potato. It’s about the size of the nail on my index finger! I boiled it up with the other potatoes, which I used in a curry that I will write about tomorrow. But this potato, and a few others about as small, I simply ate by themselves after cooking. Let me tell you — popping a boiled potato like an M&M is a strange and wonderful experience.